Now that we know how to create our timelines (sequences) it would be helpful to understand how to organise our projects so that our various timelines can easily be found. 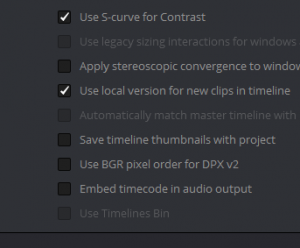 To do this, it would be helpful to have a separate bin for your timelines rather than just having them inside of your bin with your clips which can make them a little hard to find. 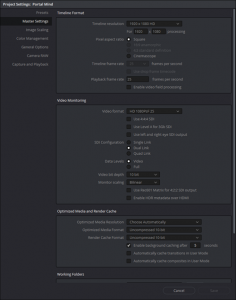 While you can do this in a number of ways, there are some helpful settings and preferences that allow us to have these bins automatically created for us. 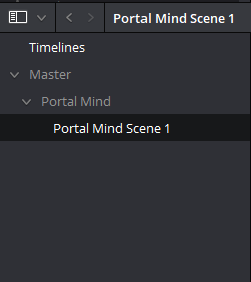 The first option can be used only IF YOU HAVE NOT YET CREATED ANY TIMELINES as it will not be available once a timeline has been created. Go to ‘File>Project Settings’ or hit ‘Shift + 9’ or click on the small cog icon at the bottom RHS of the UI to bring up your project Settings. 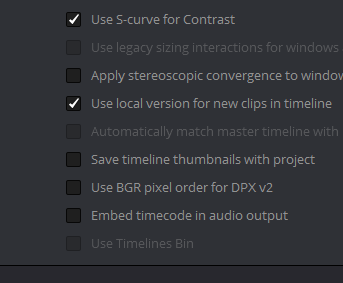 Now click on ‘General Options’ and scroll down to ‘Color’ where you will find a checkbox for ‘Use Timeline Bin’. 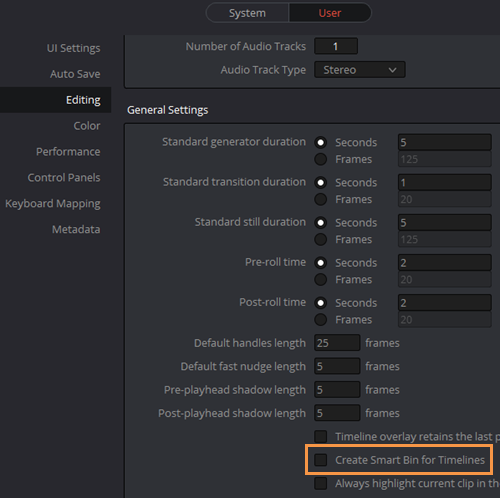 Once selected, hit ‘Save’ and a new ‘Timelines’ bin is created in your project browser. Now when any timeline is created, that timeline will reside inside this bin. 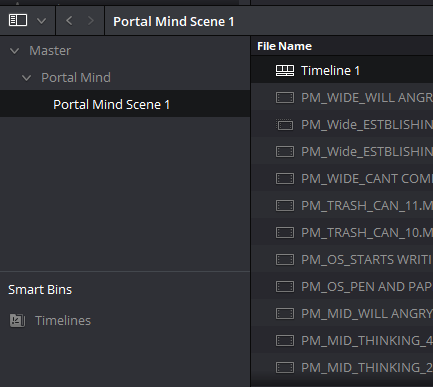 The advantage of this bin is that timelines are ONLY stored in this bin and not anywhere else in the project. 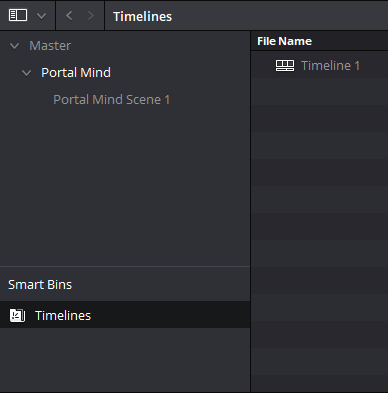 If you haven’t created this bin the timeline would be in whatever folder you had selected when you created the timeline. 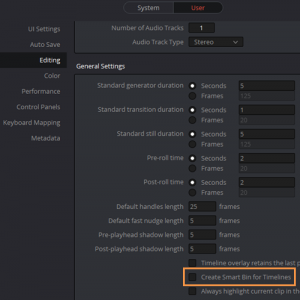 However, if you have already created a timeline, this option will not be available, so there is another option in the ‘Preferences’ Panel. 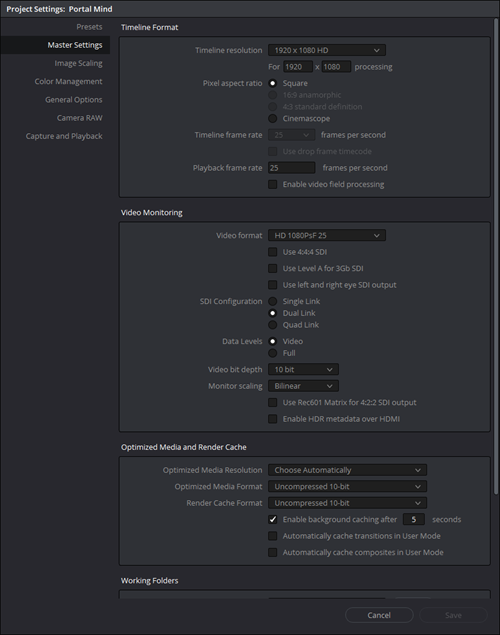 Choose ‘Davinci Resolve (top left) > Preferences’ and look for the ‘User’ tab and then on to ‘Editing’. 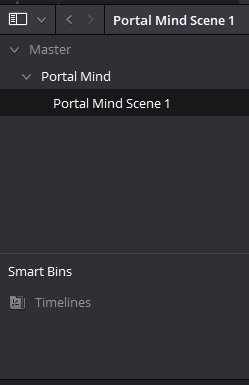 In there you will find an option to ‘Create Smart Bin for Timelines’. Check this and click ‘Save’ and a new Smart Bin is created (we will look at Smart Bins in more detail in another blog). With this options, Timelines are still inside the bin they were created from, but are also available in the ‘Smart Bin’ which is simply a bin that has specific filers applied so that only items that match those filters appear in the bin (in this case that it is a timeline). … and simply moving the timelines from the bins they are created (or the smart bin) into the new bin or bins you’ve made. 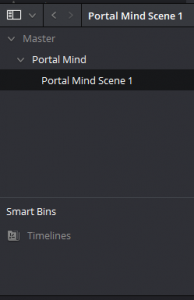 As well as showing up in the bin or bins you created they will also still show up in any ‘Timelines Smart Bin’ because that bin is always looking for anything that is a timeline! 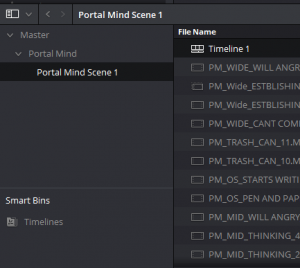 Your choice as to which method you use will depend on how you organise your projects and at what point you start looking to create timeline bins.